Access to water is an important strategic concern for many companies, but increased threats to the supply, quality, and reliability of global water resources add substantial pressure and immediacy for businesses to improve the way they manage water risk. Recognizing that business, government, and civil society share a critical interest in reducing water-related risks through common solutions, the UN Global Compact’s CEO Water Mandate has released a Framework for Responsible Business Engagement with Water Policy to facilitate effective water policy engagement. The Framework, prepared by the Pacific Institute in collaboration with WWF International, provides a way for companies to address risk and capture opportunities from external conditions that cannot be achieved through internal strategies alone. The bottom line is the need for policy that integrates environmentally sustainable, economically viable, and socially equitable water management approaches. 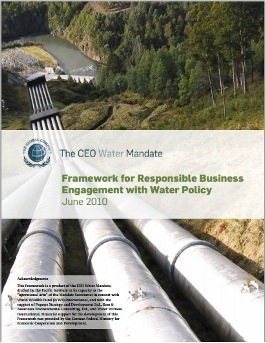 The Framework for Responsible Business Engagement with Water Policy broadens the understanding of corporate engagement as not just policy advocacy and lobbying, but also consideration of initiatives that involve interaction with government entities, local communities, and/or civil society organizations with two objectives: ) the responsible internal company management of water resources within direct operations and supply chains, and 2) the sustainable and equitable management of the river basins in which companies and their suppliers operate.